Missionary work has never been easy. Jonah faced drowning and heart break. Paul defends his mission work by boasting, not of his achievements of church planting, but of his floggings, imprisonment, and beatings. In a world of impostors the Lord authenticates genuine gospel service through the suffering of his servants (2 Tim 1:8). A history of the Church Mission Society’s first overseas work states, “There were few events of a striking or remarkable character. Missionaries and schoolmasters died, and their places were supplied by fresh arrivals from England. Thus the work suffered no interruption”. A similar account can be given of the early work of London City Mission. The journals of many brave missionaries came to an abrupt end in the 1850s when missionaries continued providing medical and spiritual help to needy Londoners throughout the cholera epidemics. Today we have fewer martyrs at London City Mission and even mission agencies have health and safety officers. There is no avoiding the fact though that working for London City Mission is not an ordinary job. We expect missionaries to face mockery and rejection. We make best efforts to ensure those working with the marginalised are kept from harm, but this work is never “safe”. Missionaries will make sacrifices of life’s comforts. Hours are based around the needs of our community, not our convenience. It is common for missionaries to labour for years in difficult parts of London seeing only a handful of professions of faith, and there is nothing more heart breaking than seeing a young person you’ve invested years of life into, slipping back into addiction and despair. The Lord puts his glorious gospel in jars of clay so that it is clear that the good news is the work of the Holy Spirit within. The same Spirit at work in Paul is now at work in us. The same Lord who raised Jesus from the dead is now strengthening us. The same wonderful hope that Paul had of eternal glory, is also our hope, and so we don’t despair. Each week we hear wonderful news from around the mission of God’s word proclaimed and lives transformed, but our strength and hope isn’t dependent on that. The gospel that we preach to London is the gospel that we preach to ourselves. We marvel at the grace of God to us, and are excited about His name being glorified. It is as we look forward to the hope of eternity that we have the strength to carry on. The gospel perspective is vital to our ministry. If our focus was on human success then we would behave differently. If our aim was for a comfortable life then we would place our missionaries in areas with the best schools for our kids, not the neediest places. If our aim was to prove how attractive we are then we would build outreach centres in areas with large numbers of existing Christians and we’d win them over with better music or child care so we could shout of our numerical triumph. 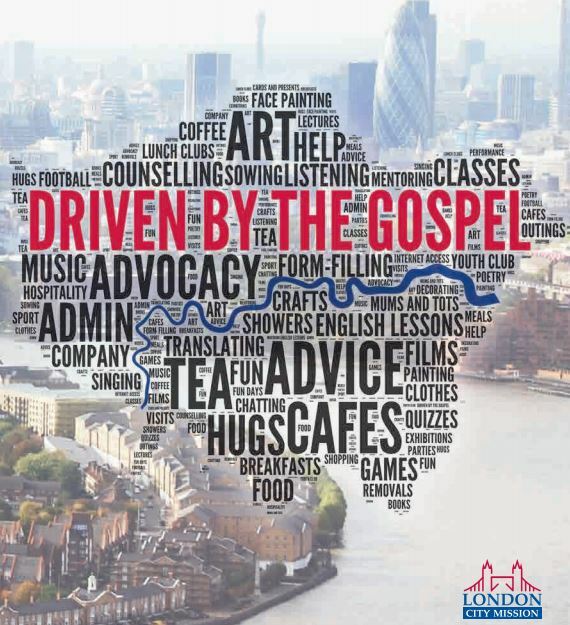 If our aim was for a ministry that won worldly acclaim then we might still work with London’s poorest, but we’d put pictures of them all over our literature and win accolades for our social work, quietly forgetting about Jesus. Our desire is to see the Lord’s name glorified in every part of London; in Forest Gate and Kilburn, in Brixton, Dagenham, and Ilford. We don’t focus on the places with growing house prices, instead we’ve surveyed London to find the places with the lowest density of churches. Our missionaries do extraordinary work, but we are ordinary Christians. All Christians are called to the extraordinary ministry of proclaiming Jesus in Samaria and to the ends of the earth. All of us should have the same gospel motivation. I pray that more Christians in London would have a missionary perspective on where they choose to live, how they use their time. The church of London has plenty of resources to reach the neediest parts of our city with the gospel, but we often lack the gospel perspective to fully engage with the mission before us. I give thanks for the missionaries who have taken up this extraordinary task but I pray for many thousands more ordinary Christians who will reach out with good news, even if they are not on the London City Mission payroll. Thanks @chaplaineliza , I suspect that there is something wonderful, frustrating, encouraging, tiring, amazing about serving needy people ask around the world.